The University at Albany has a variety of sports facilities that can accommodate many sporting events. The facilities are state of the art and are appropriately equipped to fulfill the needs of sporting games and tournaments. The facilities are handicapped accessible and parking is available. SEFCU Arena: An $11 million state-of-the-art facility. 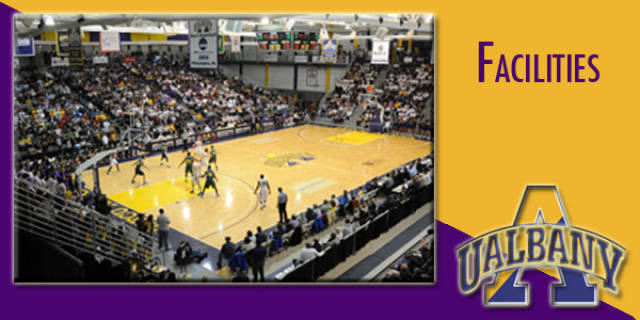 The SEFCU Arena is the home for UAlbany’s men’s and women’s basketball teams, and has an .11 mile indoor track. The 5,000-seat arena also serves as a major venue for community events such as rock and pop concerts, sporting events and University activities. Bob Ford Field at Tom & Mary Casey Stadium: The University at Albany’s $19 million multi-sport complex was completed in September 2013. The stadium field turf is home to UAlbany Great Danes NCAA Division I football and soccer programs. The state-of-the-art 8,500-seat facility includes a distinct press level with four luxury suites, print media area, and booths for radio, television, coaches, and replay, as well as 20 high-definition televisions distributed throughout the level. The stadium also features a $1.1 million Daktronics scoreboard with a 39’ by 22’ high-definition video display and point-source sound system behind the south end zone. John Fallon Field: Home for UAlbany men’s and women’s lacrosse, all-weather turf field, a Sportexe Momentum Turf 41 surface, seating capacity of 2,500, adjacent to Alumni Turf Field, which serves as the home for the school’s field hockey team and as a multi-use recreational field for UAlbany students. Track & Field Venue: Completed in 2013, located adjacent to the Physical Education building in the site of former University Field, has a 9-lane IAAF certified track. The surface is Olympic-caliber Beynon BSS 2000 that features a force reduction layer of butyl rubber and full-depth color Polyurethane. Other top track and field venues that have this surface include the University of Oregon’s Hayward Field and multiple national track and field champion Texas A&M. There is a natural turf infield that includes a throws area as well as an irrigation system. There is also a separate hammer throw area adjacent to the venue. The venue is used strictly for track and field activities. 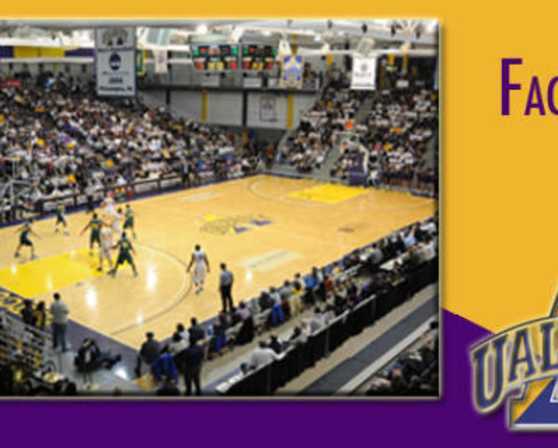 University Gym: Home to the UAlbany Women's Volleyball team and serves as a practice facility for baseball, softball, field hockey and lacrosse. The facility is comprised of three full-size playing surfaces which can be used for basketball, volleyball, and tennis. Albany Field: Albany Field, just to the west of the Physical Education Building and University Field, serves as the home venue for the UAlbany NCAA DI softball program. Recent improvements include: outfield fencing with a warning track; windscreens with a yellow fence cap; new foul poles, a new bullpen, and an inning-by-inning scoreboard installed in left-center field. Varsity Field: Varsity Field has served as the University at Albany’s on-campus baseball stadium for more than 30 years. UAlbany currently competes as an NCAA DI program. Significant upgrades include: left field fence pushed back to 346 feet down the left-field line and 388 feet in the left-center field gap, while a section of the center field fence was raised 20 feet. Additionally, windscreens with a yellow fence cap were added to the fencing, improving the field’s playing conditions and its aesthetic look. Other improvements included a warning track inside the outfield fence, new foul poles, new bullpens and hitting cages beyond the left-field fence and an inning-by-inning scoreboard was installed. University Courts: The facility boasts 8 regulation tennis courts.